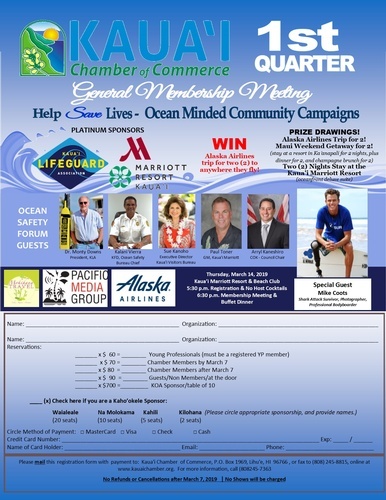 "Help Save Lives - Ocean Minded Community Campaigns"
Join us at our 1st Quarter Membership Meeting, sponsored by Kauai Lifeguard Association and the Kauai Marriott Resort & Beach Club. You could also win an Alaska Airlines trip for two to anywhere they fly!!! Maui Weekend Getaway for 2! Two (2) nights stay at the Kauai Marriott Resort in an oceanfront deluxe suite!